Established in 1925 by a former United States Senator and his spouse, in memory of seventeen-year-old John Simon Guggenheim, the elder of their two sons, who died April 26, 1922. 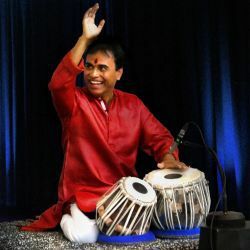 The internationally-celebrated Tabla virtuoso and composer made his debut performance at the age of 17 with world famous sitar player Pandit Ravi Shankar, and started learning his art/craft at the age of 7, in the guru-shishya tradition of India. Das has played with Yo-Yo Ma, Paquito D’Rivera and numerous other iconic musicians, as well as in orchestras, among them, the New York Philharmonic, The Chicago Symphony Orchestra, and The Boston Symphony Orchestra. He has played at Carnegie Hall, Lincoln Center, Royce Hall, The Royal Albert Hall, Hollywood Bowl, the Kennedy Center and the Concertgebouw, and at events like the 150th anniversary of the UNO at the General Assembly Hall (NYC), the opening ceremony of the Special Olympics in Shanghai (China), the opening ceremony of the first Asia Expo in Kunming (China), the World Economic Forum (China). He has also performed for visiting dignitaries like the Queen of England, the Queen of Thailand, the Pope, and various other world leaders. A Grammy winner, Das’ most recent composition, Vaishnavi, was commissioned by the Freer|Sackler and can be heard on display near the statue of Queen Sembiyan Mahadevi in the museum gallery. In 2009, Das founded HUM, an acronym standing for (H)armony and (U)niversality through (M)usic, which promotes cross-cultural music exchange and provides financial assistance to specially-abled children with an aptitude for the arts. Das, a Gold Medalist in English Literature from Banaras Hindu University, Das has also been an artist-in-residence at Dartmouth, Brandeis, UC Santa Barbara, UC Santa Clara, and College of the Holy Cross. He currently lives in Boston. Devaraj is a professor of Chemistry and Biochemistry at the University of California, San Diego. His lab focuses on understanding how non-living matter, such as simple organic molecules, can assemble to form life. His work has enabled the first demonstration of perpetually self-reproducing lipid vesicles and artificial membranes that can dynamically remodel their chemical structure. Recently, his lab has demonstrated that in situ synthesis can assemble lipid species within living cells, enabling studies that decipher how lipid structure affects cellular function. 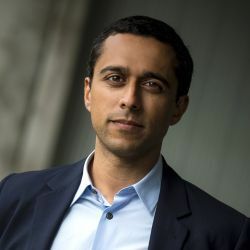 Raised in Manhattan Beach, California, Prof. Devaraj graduated from the Massachusetts Institute of Technology, with dual bachelor’s degrees in Chemistry and Biology. He did his Ph.D. in chemistry from Stanford University and earned a postdoctoral fellowship at the Harvard Medical School, before joining University of California, San Diego. He has been recognized with several awards including the 2016 National Fresenius Award; the 2017 American Chemical Society Award in Pure Chemistry; he was selected as the 2018 Blavatnik National Laureate in Chemistry, and the 2019 Eli Lilly Award in Biological Chemistry. In recognition of his contributions to teaching, Dr. Devaraj was named a 2016 Camille Dreyfus Teacher-Scholar.